"Vila Rica" redirects here. 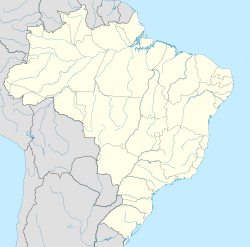 For a municipality in the state of Mato Grosso, see Vila Rica, Mato Grosso. In the 18th century, Ouro Preto became for a time the most populous city in the New World, with an estimated population of 80,000 in 1750. At that time, the population of New York was half that number, and the population of São Paulo did not reach 8,000. Villa Rica de Ouro Preto (19th century). Founded at the end of the 17th century, Ouro Preto (meaning Black Gold) was originally called Vila Rica, or "rich village", the focal point of the gold rush and Brazil's golden age in the 18th century under Portuguese rule. The city centre contains well-preserved Portuguese colonial architecture, with few signs of modern urban development. New construction must keep with the city's historical aesthetic. 18th- and 19th-century churches decorated with gold and the sculptured works of Aleijadinho make Ouro Preto a tourist destination. The tremendous wealth from gold mining in the 18th century created a city which attracted the intelligentsia of Europe. Philosophy and art flourished, and evidence of a baroque revival called the "Barroco Mineiro" is illustrated in architecture as well as by sculptors such as Aleijadinho, painters such as Mestre Athayde, composers such as Lobo de Mesquita, and poets such as Tomás António Gonzaga. At that time, Vila Rica was the largest city in Brazil, with 100,000 inhabitants. In 1789, Ouro Preto became the birthplace of the Inconfidência Mineira, a failed attempt to gain independence from Portugal. The leading figure, Tiradentes, was hanged as a threat to any future revolutionaries. In 1876, the Escola de Minas (Mines School) was created. This school established the technological foundation for several of the mineral discoveries in Brazil. Ouro Preto was capital of Minas Gerais from 1720 until 1897, when the needs of government outgrew this town in the valley. The state government was moved to the new, planned city of Belo Horizonte. Although Ouro Preto now relies heavily on the tourism industry for part of its economy, there are important metallurgic and mining industries located in town, such as Novelis, formerly Alcan, the most important aluminum factory in the country, the Companhia Vale do Rio Doce, and others. Main economic activities are tourism, transformation industries, and mineral riches such as deposits of iron, bauxite, manganese, talc and marble. Minerals of note are: gold, hematite, dolomite, tourmaline, pyrite, muscovite, topaz and imperial topaz. The imperial topaz is a stone only found in Ouro Preto. Soapstone handicraft items are a popular souvenir among tourists, and can be found in many shops in the town centre and street fairs. Jewelry made of local precious and semi-precious gemstones (such as hematite) can also be found in abundance for sale. Ouro Preto is also a university town with an intense student life. The Universidade Federal de Ouro Preto (Federal University of Ouro Preto or UFOP) has approximately 10,000 students in the city. Many of them live in communal houses that are somewhat similar to fraternity houses as found in North American colleges. These communal or shared houses are called repúblicas, of which 66 belong to the university, called repúblicas federais, and 250 are privately owned (repúblicas particulares). The repúblicas system of Ouro Preto is unique in Brazil. No other university city in the country has exactly the same characteristics of the student lodgings found there. It shares traits with the repúblicas of the Portuguese University of Coimbra, where the tradition originated. Before universities were founded in Brazil, Coimbra was where most of the rich students who could afford an overseas education went to. Each república has its own different history. There are repúblicas in which the freshmen, also known as "bixos" (misspelling of "bichos", Portuguese for "animals"), have to undergo a hazing period, called batalha (battle), before being accepted permanently as residents of the houses. The final choice of the freshmen, called escolha, has to be unanimous among the senior students of the house. The Museu Mineralógico Da Escola De Minas (Mineralogy Museum) can be of special interest to visitors. It belongs to the UFOP's School of Mining, which opened its doors on 12 October 1876. The Museum is located at the Praça Tiradentes (No. 20), in the town's historical center, and contains a rich assortment of minerals on display, including precious and semi-precious gemstones and large crystals. Security is tight, however (for example, no cameras are allowed), due to the incalculable value of the gemstones and ores on display. Ouro Preto is a major tourist destination, for its well-preserved colonial appearance with old buildings and cobblestone streets. Igreja de São Francisco de Assis (Church of Saint Francis of Assisi). Nossa Senhora do Carmo (Our Lady of Mount Carmel) - just off Tiradentes Plaza, next to the Inconfidência Museum. Museu da Inconfidência - In the former municipal palace on Tiradentes Plaza, traces the Inconfidencia independence movement. Museu do Oratório (Oratory Museum) - next to the church of Nossa Senhora do Carmo, displays religious art. Museu de Ciência e Téchnica (Museum of Science and Technology) - in the Ouro Preto School of Mines building on Tiradentes Plaza. The museum is noted for its collection of beautiful mineral specimens. Casa Dos Contos - Historical museum. A number of former gold mines in the city offer tours to tourists. One of the most well known is the Mina do Chico Rei, near the sanctuary of Nossa Senhora da Conceição. Another infamous mine is the Mina da passagem. In the early 19th century, Portugal gave the United Kingdom exclusive use of this mine for 100 years to pay Portugal's sovereign debts. This is the world´s largest mine open to the public. The municipality contains about 10% of the 31,270 hectares (77,300 acres) Serra do Gandarela National Park, created in 2014. The street carnaval in Ouro Preto attracts thousands of people every year. Traditional band music is played across town, and many people dress up in costumes during the holiday. There are two main types of street parade in town: the one with samba schools and the one with blocos. Carnaval usually takes place in February or March, depending on the timing of Lent. It starts on the Saturday immediately before Lent and ends the day before Ash Wednesday. The street party is also celebrated in neighbouring towns such as Mariana. Ouro Preto was a setting in the comedy movie Moon over Parador (1988), with actors Richard Dreyfuss and Sonia Braga. Brazil is the 6th largest mining industry. Jump up ^ Gomes, Laurentino (2007). "A Colônia". 1808 (in Portuguese) (2 ed.). São Paulo: Editora Planeta. p. 131. ISBN 9788576653202. 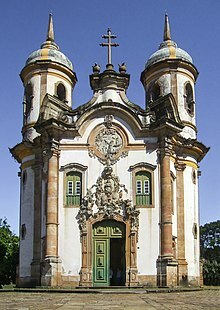 Wikivoyage has a travel guide for Ouro Preto.